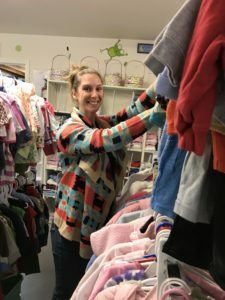 Volunteering is at the heart of what makes Philomath Community Services so special. Are you interested in helping with any of our five programs? If so, please download the Volunteer registration form here. Or, if you have a desire to become a PCS board member, please download the Board Member registration form here. In 2017, approximately 19,289 volunteer hours were donated to PCS. If our volunteers were paid $15 per hour, this would have resulted in a cost of $289,335.00 in wages! PCS is a volunteer-based agency with a paid Executive Director and is overseen by a board of directors made up of Philomath and Benton County residents. We welcome your involvement at any level. Contact us to find out more about this organization, our amazing volunteers, and the people we serve. June’s Kids Kloset is looking for a volunteer manager and volunteers to work in the store. The manager commitment would take 6 – 8 hours per week and the volunteers can commit to any hours on Tuesday or Thursday. See the link below to apply.